Definition at line 32 of file sprite.h. Definition at line 37 of file sprite.h. References A_NONNULL, A_WARN_UNUSED, draw(), getHeight(), getImage(), getWidth(), play(), reset(), setSpriteDirection(), ServerCommandType::time, and update(). Definition at line 124 of file sprite.h. Draw the current animation frame at the coordinates given in screen pixels. Implemented in Being, FloorItem, AnimatedSprite, and ImageSprite. Returns the current alpha opacity of the animated sprite. Definition at line 102 of file sprite.h. References getCurrentFrame(), getFrameCount(), and mAlpha. Returns the current frame number for the sprite. Implemented in AnimatedSprite, CompoundSprite, and ImageSprite. Returns the frame count for the sprite. Definition at line 115 of file sprite.h. Definition at line 118 of file sprite.h. 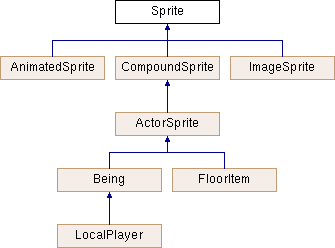 Implemented in Being, ActorSprite, AnimatedSprite, CompoundSprite, and ImageSprite. Referenced by CompoundSprite::getHeight(), NpcDialog::logic(), NpcDialog::showAvatar(), and ~Sprite(). Returns a reference to the current image being drawn. Referenced by CompoundSprite::getWidth(), NpcDialog::logic(), NpcDialog::showAvatar(), and ~Sprite(). Plays an action using the current direction. Reimplemented in ActorSprite, AnimatedSprite, and CompoundSprite. Definition at line 96 of file sprite.h. Inform the animation of the passed time so that it can output the correct animation frame. Definition at line 129 of file sprite.h. Referenced by AnimatedSprite::AnimatedSprite(), CompoundSprite::CompoundSprite(), ImageSprite::draw(), AnimatedSprite::draw(), Being::drawCompound(), Being::drawPlayerSprites(), AnimatedSprite::drawRaw(), AnimatedSprite::drawRescaled(), CompoundSprite::drawSimple(), CompoundSprite::drawSprites(), getAlpha(), ImageSprite::ImageSprite(), setAlpha(), CompoundSprite::setAlpha(), and AnimatedSprite::setAlpha().